Greek leopard 2a6 is uploaded in DL section and awaiting admin aproval! Sorry for long wait but my real life duties did not give me much time for work on this textures (and other skins which you will see in screenshots folder of this download). I managed to take some short time to correct some details and upload it in DL section. I need to do some additional makeup but... Please note that this skin come in two versions (v1,v2) where one recreates paint scheme on right hull side (v1) and another left side(v2) on greek tank. Also you will find "following uploads" folder where you will see some screenshots of following ASLAV & Desert mega packs plus new bradleys (now equally dirty like default M1 skin so that they fit much better to each other). I hope that you will find some good use of this. Thanks! Greek leopard 2a6. This download comes with two versions of skin and some screenshots of following uploads. Good work Daskal, sounds fantastic! Yes, no problem Jlh. Sorry for waiting but i had tough last week so i did not finished work over some details. I will upload it as soon as i can. Thanks for interest, I appriciate it. Good work on Hellenic Leopard 2a5 Alan! Thanks! Im really glad you all like this. About greek camo,...Well yes i also before few days watched those Leopards and thought, man what a unatractive red (brick-red) color. Strangely, the more i watched this camo the more i liked it. I think that great portion of land in Greece is similar to Croatian Istra and Dalmatia region, which are greatly covered (Istra especialy) with red soil "Terra rosa". Those Leos whould blend in this enviroment pretty good. Yesterday i experimented with greek camo on Leopard 2E textures and after some time i created this skin. 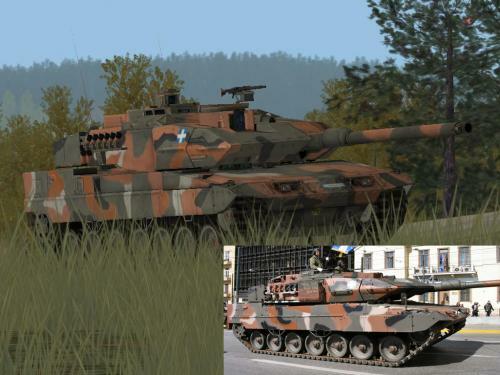 I used original photos and Alan´s Leopard 2a5(from VHAF.org) for general orientation during creation of camo pattern for this skin. Very nice work on MERDC, Scorpius. I expect them in download section soon. Woodland and winter versions looks excellent. :debile2: Now, when we already talking about new projects i have good number of new skins for upload. Some of them are bearly a gamma - lightnes adjustment but some of them are little more of that. Generaly i worked on texture packs where every unit have same (or at least similar) color tone. Below are shown few examples. Good work C_Colossus, i like it alot! Skirts look fantastic. Nice work on NTC, Scorpius! Here are few pixs from M1 jungle troops and Leo 2a6 on battlefield. Will there ever be a save option? I completely agree with Legitz, save option whoud be from great help in this sim. In real life i dont have much time to spend behind computer especially to be fully concetrated during play in SB for several hours, and you all know how long can be SB missions. So i play only short scenarios, for any longer sce. this "Save" option whoud be of great help. Most of us here are not professional tankers and playing SB on work dont goes in job description. Gibsonm...Wow! Merry Christmas to all people of good will!